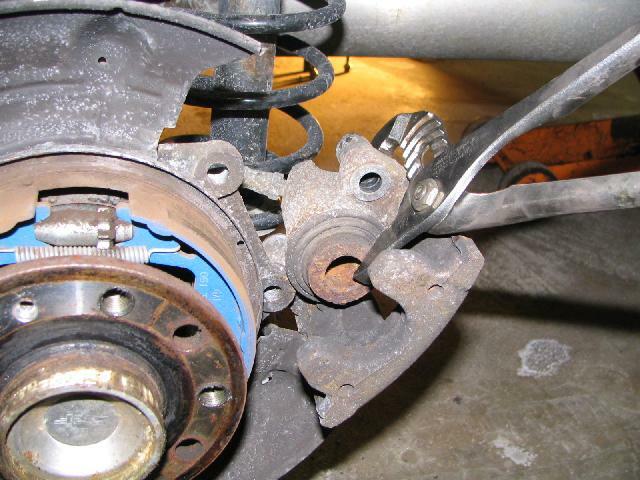 If you are reusing the old caliper, you need to push in the piston before the new pads will fit correctly. I use a big set of adjustable pliers to do this. If the piston does not go back in easily, the piston could be seized and you need to either rebuild or replace the caliper. Time to install the new rotor and pads! You have to remove the oil coating on new rotors before installing them. 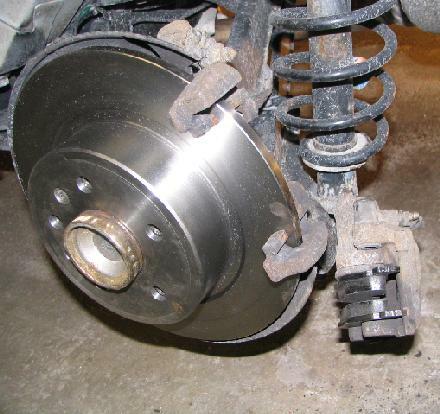 I use lacquer thinner, but brake cleaner will work just as well. Once this is done, place the rotor on the hub and use the small screw to hold it in place. The proper hole is the recessed one on the rotor and the screw only fits in the smaller hole on the hub. If you destroyed the small screw, you can use a lug bolt to hold the rotor in place. To make installing the new pads easier, separate the caliper from the yoke. 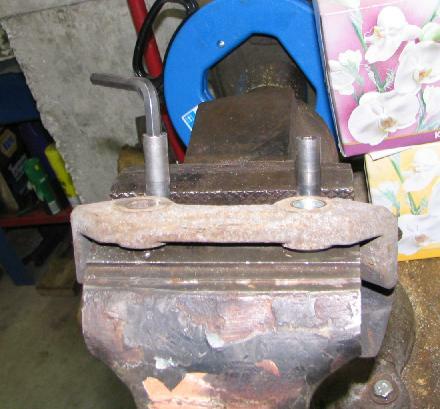 Using a vice to hold the yoke, remove both studs. Now, install the yoke onto the car. For 2001 and lower 9-5's, the torque setting is 86 ft/lb's for the caliper mounting bolt. For 2002 and higher 9-5's, the torque setting is 103 ft/lb's plus 45 degrees. 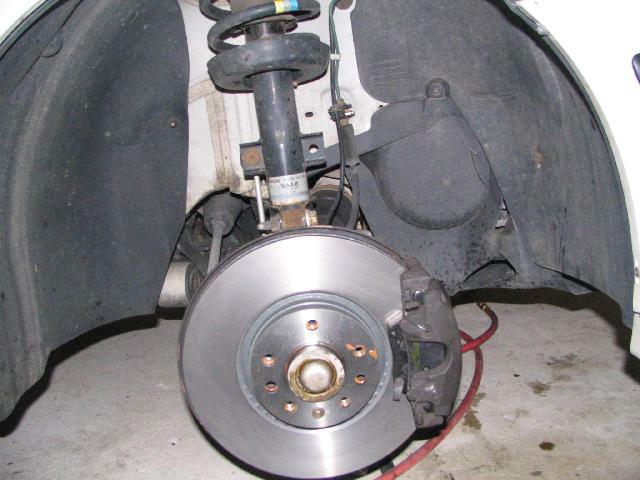 Place the pads into the caliper. The pad that goes into the piston can be difficult as the retaining tabs are pretty strong. I bent mine a little bit to make this easier! Now place the caliper onto the yoke and reinstall the studs. These do not have to be super tight. Attach the brake line hose and attach the caliper spring. 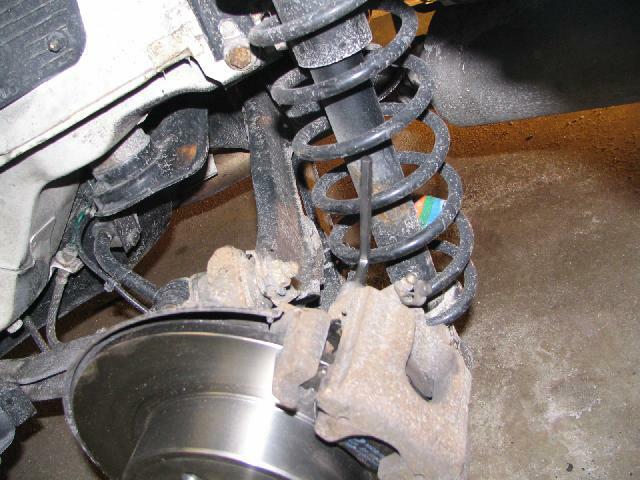 Putting on the caliper spring can be a bit of a challenge. First insert one end in the hole and then use small pliers to stretch the spring close to the second hole. I use a small hammer to help the spring find its home!